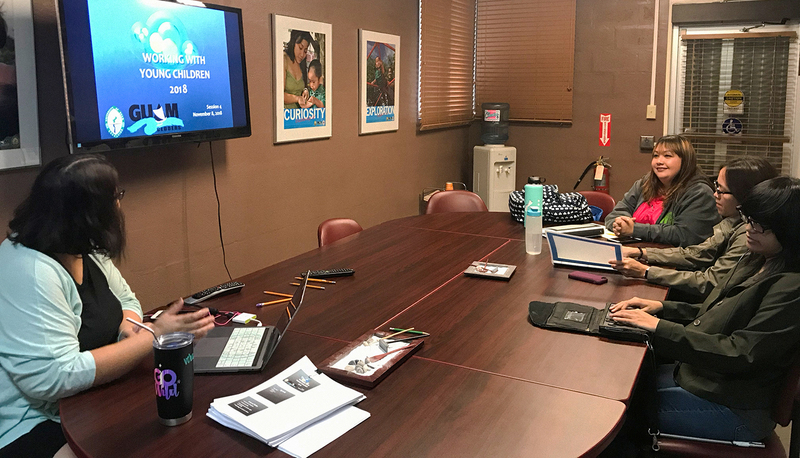 Vera Blaz, Guam CEDDERS Training Associate and Project Bisita I Familia TA and Training Coordinator, facilitated training on November 20 on the impact of domestic violence in early childhood for Maternal Child Health Program staff and Project Bisita home visiting staff. 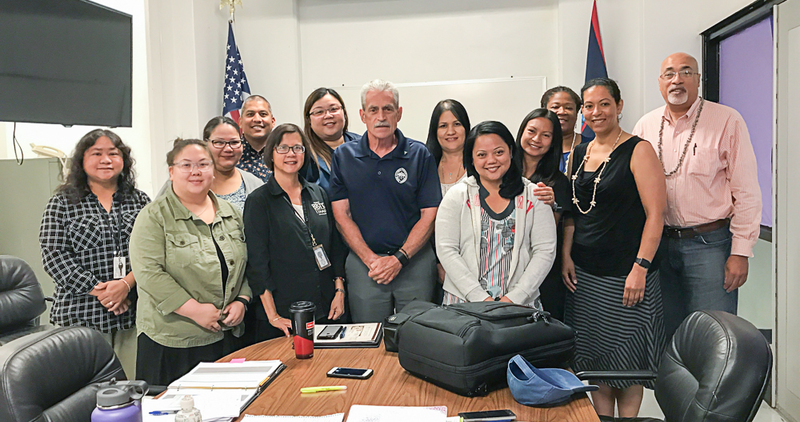 On September 18-20, Ellie Jimenez (seated third from right), Healthy Families America national trainer, provided training on “Facilitating Change: Motivational Interviewing.” Project Bisita I Familia home visitors, Kariñu service providers and family partners, and Department of Education Guam Early Intervention System service providers were in attendance. The training focused on understanding the stages of change, which can provide insight into the process of change and how to best support the process with families. Guam CEDDERS staff Vera Blaz, Jenika Ballesta, and JJ Mendiola participated in this training. Vera Blaz (second from right), Guam CEDDERS Training Associate and Project Bisita I Familia TA and Training Coordinator, facilitated orientation training on October 11 for new home visiting staff. Home visitors learned about the development of the home visiting program as well as how to administer and score the Ages and Stages Questionnaires Third Edition (ASQ-3) and the Ages and Stages: Social Emotional (ASQ: SE). 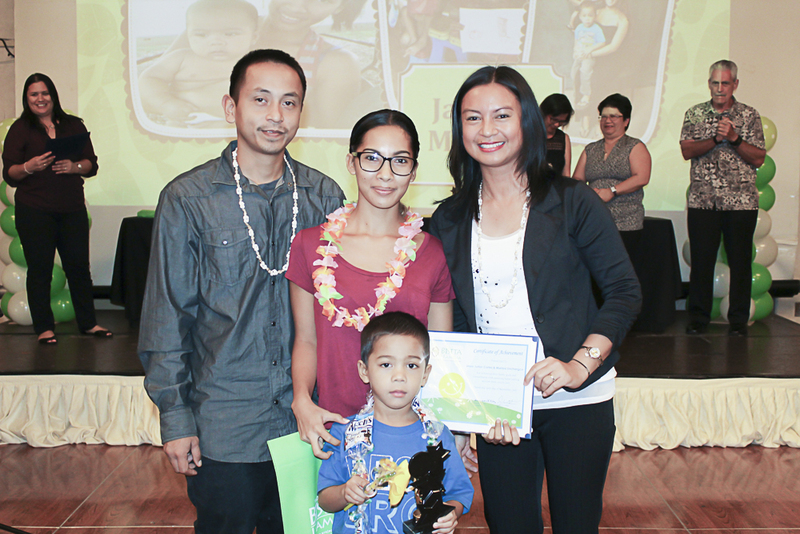 Sherill Tinio (right), Project Bisita I Familia home visitor, poses with one of her families that graduated from the program on September 16. 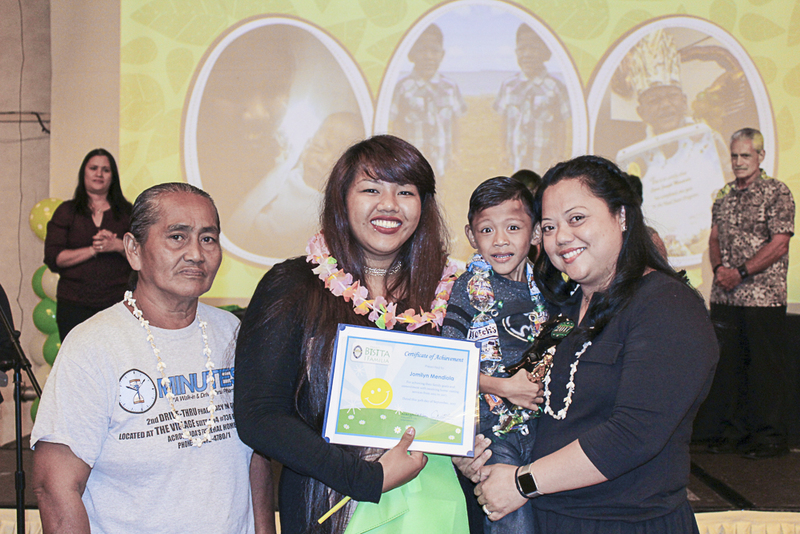 Relida Sumaylo (right), Project Bisita I Familia home visitor, poses with one of her families that graduated from the program on September 16. 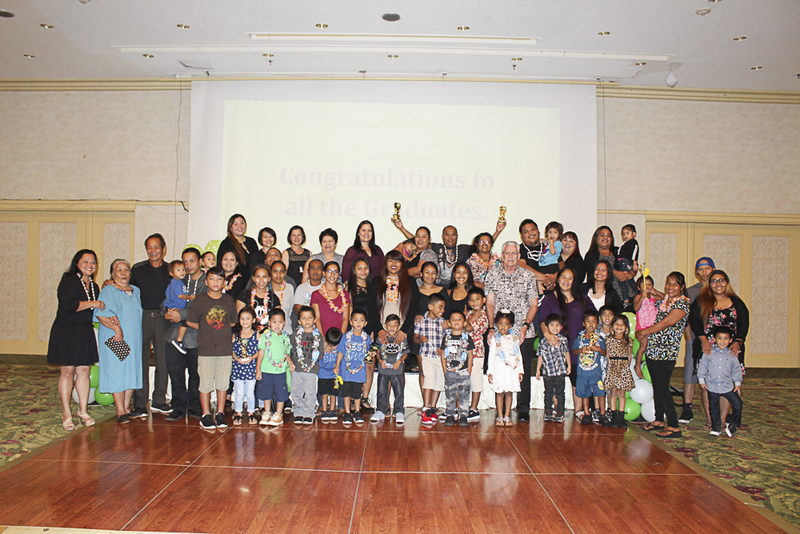 Project Bisita I Familia graduates 10 families from the program on September 16 at the Pacific Star Resort and Spa. The families pose for a group photo following the ceremony. 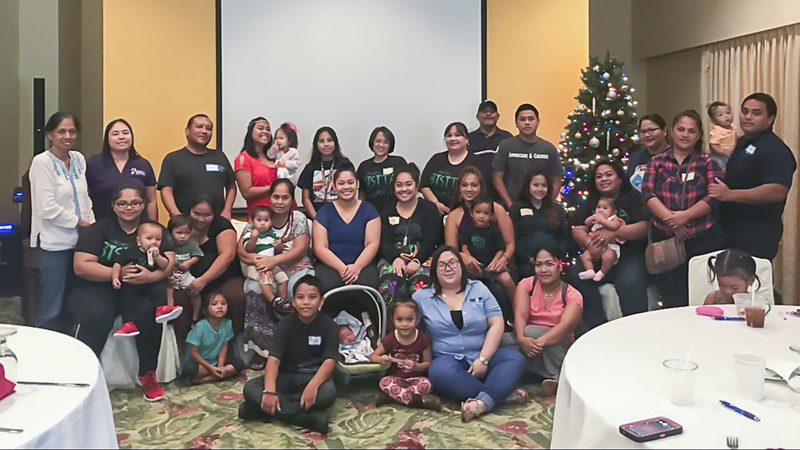 On December 1, 2012, Project Bisita I Familia home visitors embarked on a journey to provide a new kind of home visiting services to families on Guam. 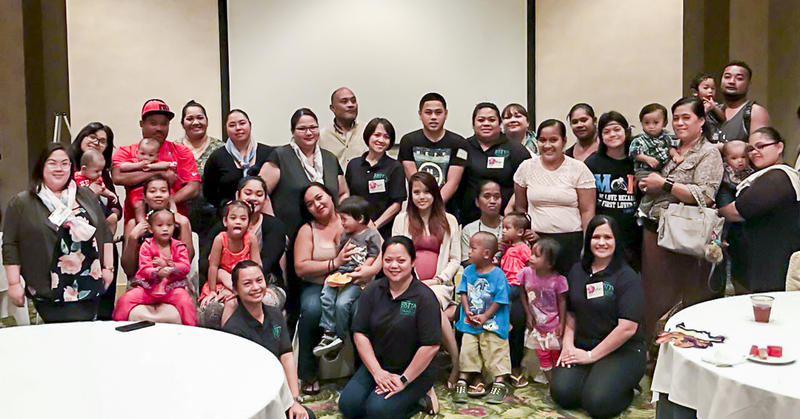 Grounded in its mission to improve the well-being of Guam’s children, birth to 8 years of age, and their families, through evidence-based home visiting services, Project Bisita I Familia has made a difference in the lives of many families. Project Bisita is a free and voluntary program that was developed to encourage positive parent-child interactions, give parents the knowledge to support their child’s health, growth, and development; strengthen parents’ confidence, prevent child abuse and neglect, promote effective communication between parents and children, and improve coordination of services with other programs. Project Bisita uses the Healthy Families America® (HFA) home visiting model. In 1992, Prevent Child Abuse America® launched the HFA home visiting model to address high rates of child abuse occurrences to children under five. The program was designed to promote positive parenting, enhance child health and development, and prevent child abuse and neglect. Project Bisita began its pilot home visiting program with three (3) full-time home visitors serving eight (8) enrolled families. As of September 2017, Project Bisita had 58 families enrolled in the program. These families started out receiving home visiting services once a week. Since the program is strength-based and family-driven, the families would set manageable goals with short time frames. Activities that emphasized healthy development and positive discipline were also given to parents to use in the home. As families achieved their goals, the home visits decreased in number. When goals had been met and evidence of positive outcomes were seen, families received home visiting services twice a month. As families became more self-sufficient, services decreased to once per month and then once per quarter. On September 16, 2017, ten families with a total of 11 children graduated from the program. These families met their goals with positive outcomes and have transitioned out of the home visiting program. The children are now enrolled in the following Department of Education programs—Preschool Gifted and Talented Education (GATE) Program, Head Start Program, or Kindergarten. Being a part of Project Bisita has given these families a hand up and a head start to future success in school and in life. 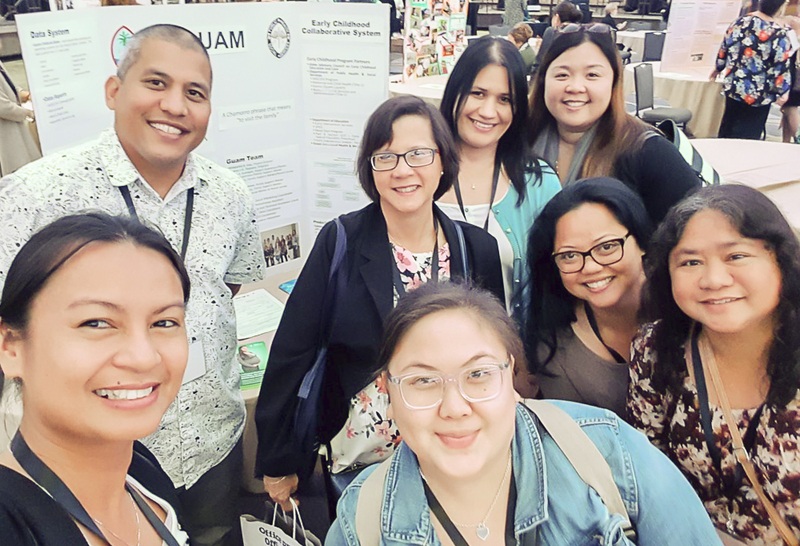 The Guam Project Bisita I Familia team shared program accomplishments during the “Display Cafe” session at the Maternal, Infant, and Early Childhood Home Visiting All-Grantee Meeting in Washington D.C. on September 6. At the request of the federal project officers, the ChildLink-Bisita database system was showcased for other state projects to see due to its comprehensiveness yet simplicity of use. 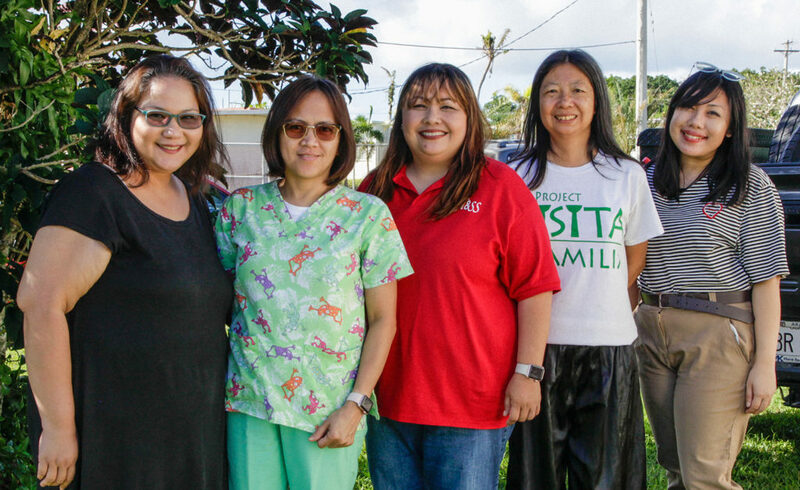 Pictured from left to right are: Sherill Tinio, Home Visitor; JJ Mendiola, Data Manager; Margarita Gay, Project Director; Jenika Ballesta, CQI Coordinator; Audrey Topasna, Project Coordinator; Relida Sumayo, Home Visiting Supervisor; Maria Dixon, Administrative Assistant; and Diana Santos, Community Assesment Worker. 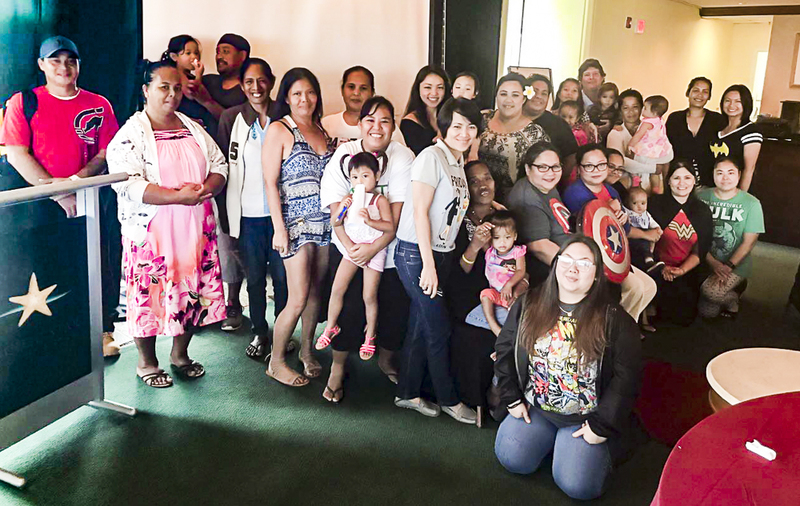 Project Bisita I Familia held a Parent Cafe, on August 18 at the Pacific Star Resort & Spa. The Parent Café theme was on “Being a Strong Parent” and focused on the 2 protective factors: 1) Parents Need to Help Their Children to Communicate/ Children’s Social and Emotional Development and 2) Being a Great Parent Is Part Natural and Part Learned/ Knowledge of Parenting and Child Development. Project Bisita I Familia staff held its Advisory Committee meeting on May 23 at the Lagu Resource Center, Dededo. (Standing; L-R): Maria Dixon, Administrative Assistant; Pat Mantanona​, Program Coordinator​​; Diana Santos, Social Worker; Nahleen Heard, HRSA/MCHB Project Officer; Vera Blaz, Training Associate; Terry Aguon,​ Human Service Program Administrator​; Helene Paulino, Program Coordinator; Relida Sumaylo, Project Supervisor; JJ Mendiola, Data Coordinator. 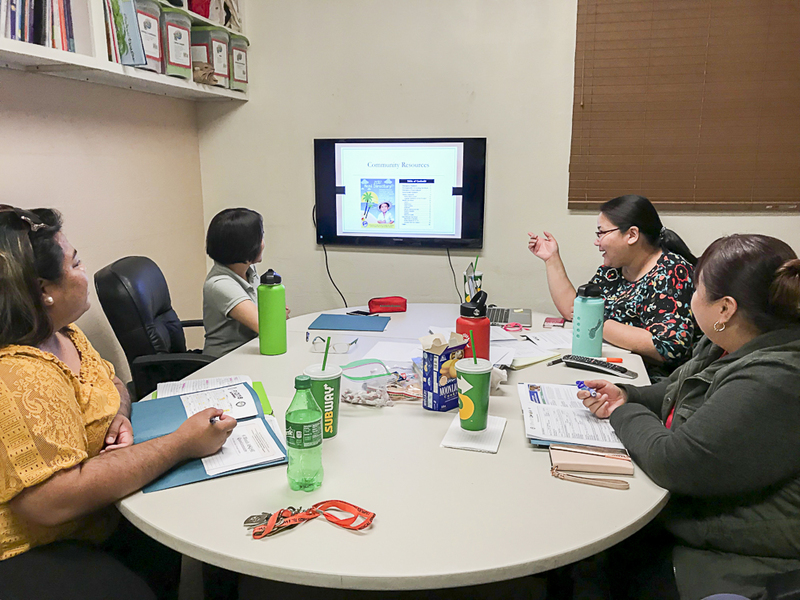 (Kneeling; L-R): Sherill Tinio, Home Visitor; Audrey Topasna, Program Coordinator; Margarita Gay, Project Director; Jenika Ballesta, CQI Coordinator; Elizabeth Calvo, Social Marketing Coordinator. 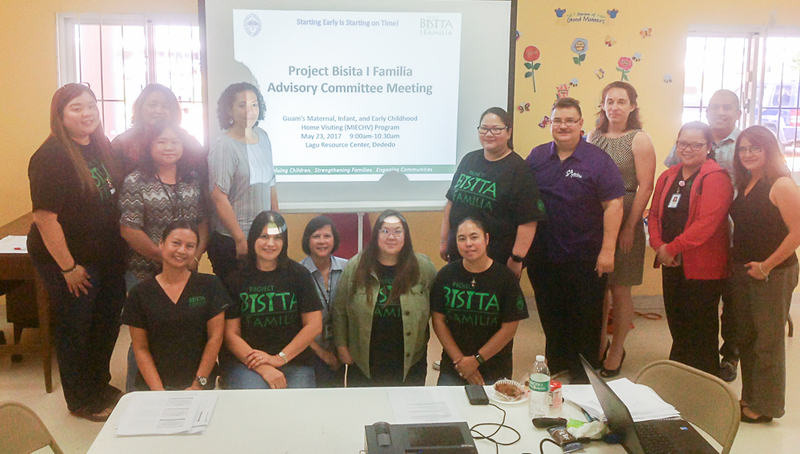 Project Bisita I Familia held an exit conference on May 26, to discuss the summary of findings from the federal on-site visit conducted by the Region IX Project Officer and representatives from The Bizzell Group, project consultants. Pictured (L-R): Diana Santos, DPHSS Social Worker; Jenika Ballesta, Guam CEDDERS Research Associate and Bisita, Continuous Quality Improvement (CQI)Coordinator; Vera Blaz; Guam CEDDERS Training Associate; Margarita Gay, DPHSS Bisita Project Director; JJ Mendiola, Guam CEDDERS Interoperability Data Manager; Maria Dixon, DPHSS Bisita Administrative Assistant; James Gillan, DPHSS Director; Audrey Topasna, DPHSS Bisita Program Coordinator; Relida Sumaylo, DPHSS Bisita Project Supervisor; Sherill Tinio, DPHSS Bisita Home Visitor; Ronda Waller, Programmatic Reviewer, Bizzell Group; Nahleen Heard, KRSA/MCHB Project Officer; George Dines, Fiscal Reviewer Bizzell Group. 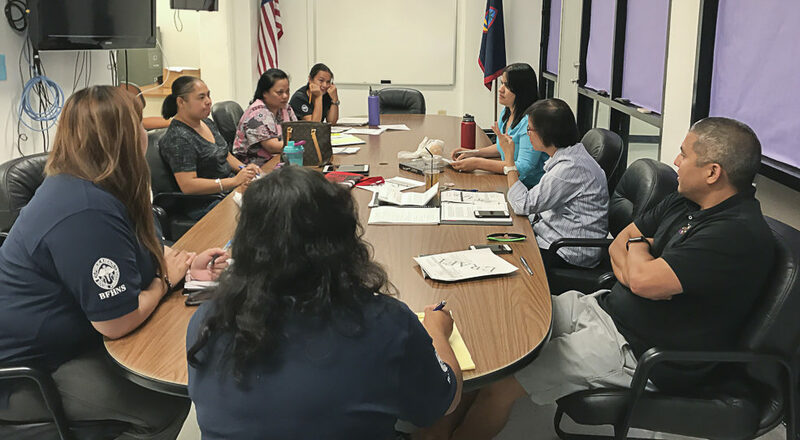 On May 11, Project Bisita I Familia staff held a planning meeting to review the agenda for the federal on-site visit with the Region IX Project Officer and representatives from The Bizzell Group. Pictured (L-R): Maria Dixon, Administrative Assistant; Elizabeth Calvo, Social Marketing Coordinator; Relida Sumaylo, Project Supervisor; Sherill Tinio, Home Visitor; Audrey Topasna, Program Coordinator; Margarita Gay, Project Director; JJ Mendiola, Data Coordinator. Not Pictured Jenika Ballesta, CQI Coordinator.